Ann Arbor (Informed Comment) – It is no surprise that Iran should be supporting the Venezuelan government of Maduro, given that both typically take anti-imperialist stands. What is astonishing is that NATO member Turkey has piled on the criticism, along with the Turkish press. It is s sign of US-Turkish relations being at their nadir. 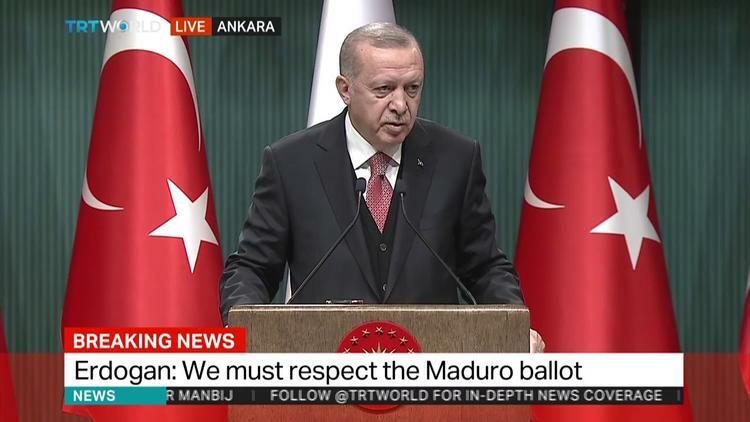 Turkish President Tayyip Erdogan said on January 25 that he rejects the American “coup attempt” in Venezuela, according to BBC Monitoring of NTV Televsion in Istanbul. He compared the situation in Venezuela to that in Egypt in June-July of 2013, when the Egyptian military took advantage of massive street crowds protesting the elected president Mohammad Morsi of the Muslim Brotherhood. Erdogan and his cabinet members have in the past also blamed the United States in part for the July 2015 failed military coup attempt against him in Turkey. Ankara is also upset at the US for its role in Syria, supporting leftist Kurds there whom Turkey views as identical with the Kurdistan Workers Party (PKK) and its guerrilla paramilitary. Turkey has applauded President Trump’s stated determination to withdraw US troops from eastern Syria. The Trump administration recognized opposition leader Juan Guaido as the rightful president of Venezuela on Jan. 24. Turkish Foreign Minister Mevlut Cavusoglu also went on Haber TV according to BBC Monitoring and declared his opposition to US “meddling” in Venezuelan politics. In the pro-government Turkish daily, Cumhurriyyet, a columnist wrote that the US was primarily driven by a desire to grab control of Venezuela’s vast oil reserves and to block the rising Moscow-Beijing sphere of influence in Venezuela. This stance is, again, mind-boggling on the part of a NATO ally, and a sign that The organization is in decline. Article 5 of the NATO treaty requires all members to come to the aid of one who has been attacked. It is a consequential treaty. [While it would not obligate Turkey to support an actual US coup in Venezuela, the level of vituperation here is unprecedented, and comes after a year in which Erdogan has repeatedly implied that he was coming for the YPG leftist Kurdish allies of the US in Syria qnd that US troops should get out of the way or else. ]* It seems Erdogan, like Trump, views it as so much kindling wood.